Some say the original namesake mill was a sawmill; others say a flaxmill. Later, when this area became a rich centre for wheat growing, the mill was converted to produce flour. Milling at this site finally ceased about the time of the First World War. Until the early 1970's, the wetlands stayed relatively undeveloped until purchased by the former Waimairi District Council. In 1986 that Council approved a Development Plan for the Reserve. However, the Council did not survive long enough to oversee the implementation of that Plan. With amalgamation of Councils in 1989, ownership of the land passed to the Christchurch City Council. In 1993 the 1986 Plan was updated and modified and the first obvious development was the construction of the three ponds in 1994/95. The toilet block followed in 1996/97 and the Styx Mill Road car park and bus stop in 2002. The dog park was added to the concept and constructed during the late 1990s. Management of land adjacent to the reserve has also undergone significant change as the large apple orchards to both the north and south of the Reserve have been replaced by the residential subdivisions known as Northwood and Regent’s Park. With the addition of various smaller pieces of land, Styx Mill Conservation Reserve now covers 60 hectares and is classified as a Metropolitan Regional Park. These parks exist to fill the gap between smaller urban parks and large national parks. Any Plan for this Reserve must also comply with the 40 Year Styx Vision the Community has already established for the Styx catchment. In the development of this site, a ‘values based’ approach to waterway and wetland restoration was used. 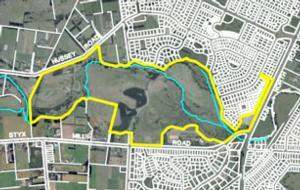 This approach recognises the following values: ecology, heritage, cultural, landscape, drainage, and recreation.